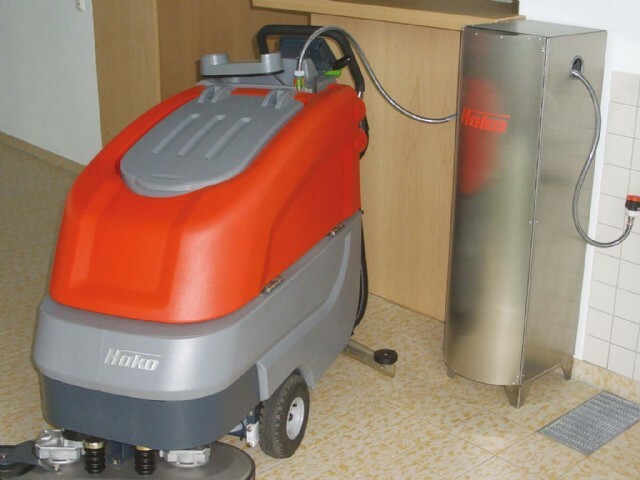 Hako Aqua Force – Chemical-free work for maintenance cleaning. In today’s world there are many cleaning detergents that have less or minimal impact on the environment. However whereever practicable, reducing the need and handling of detergents will only help the environment. Demineralised water is particularly soft and, as a result, can wash around the dirt particles very well. Due to the fact that everything has been removed from the water, it looks for the constituents again and thus “attacks” the dirt. The water dries up completely without leaving any residue. There are no stripes or lime scale edges left behind on the floor. The floor does not go grey or does not appear greasy. The surface is maintained cleaner for longer as the dirt particles are not given the opportunity of attaching themselves to the residues of tensides, soaps and detergents or lime scale. Brush made of synthetic material mixture K901; suitable for all types of floor, particularly for easy-care floor surfaces – robust, low maintenance, long brush life. Micro fibre pads prey-white – ensure an extremely high cleaning performance particularly on micro-porous floors. System with diamond pads. Particularly suitable for terrazzo, marble, granite and everwhere, where a shine is desired without chemicals. Cleaning and shine in one operation.